Get up really, really early to cook two tortillas. My plan was to cook them yesterday, but Carmen found out and didn't allow me. She argued tortillas would not be at the required quality standard if cooked the day before, that I have a reputation to honour, tortillas had to be cooked on the day. 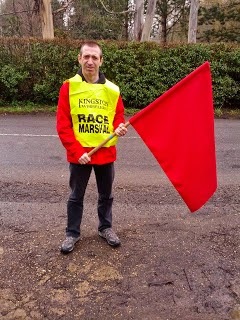 I marshalled Kingston Wheelers Dunsfold race in 2013. That day I realized how s**t my cycling pedigree was. I was 44 and seeing a real cycling race live for the first time in my live (and learning that Milan-San Remo was a monument). I even wrote about it in this blog, a shame it is in Spanish because I still think it is probably my best entry. Anyway I got so excited with the race that I wrote "I have to try this racing thing". Two years later and here I am. Lead car 2 radio operator no less, quite a promotion I would say. To be honest I'd have to confess that it was a self-assigned position with the idea of having an easy time sitting warm in the car while the others were racing so I didn't get too tired because I was racing in the afternoon. As stupid as it sounds I managed to enrol myself in the 2/3 race when I was meant to sign up for the 3rd cat only race (which would have been more than enough for me). What an experience. I learnt a lot about what is going on behind the scenes in a race. And really enjoyed seeing the race from the car. There was a solo break that got up to 48 seconds, but he was reeled back. And then another one. I immediately recognized Gareth pedalling style (so aero). He was being chased by a group of about 6 riders. He managed to keep them at about 10 seconds for a good while but finally a group of four was formed, one of them a Wheeler (Andrew). 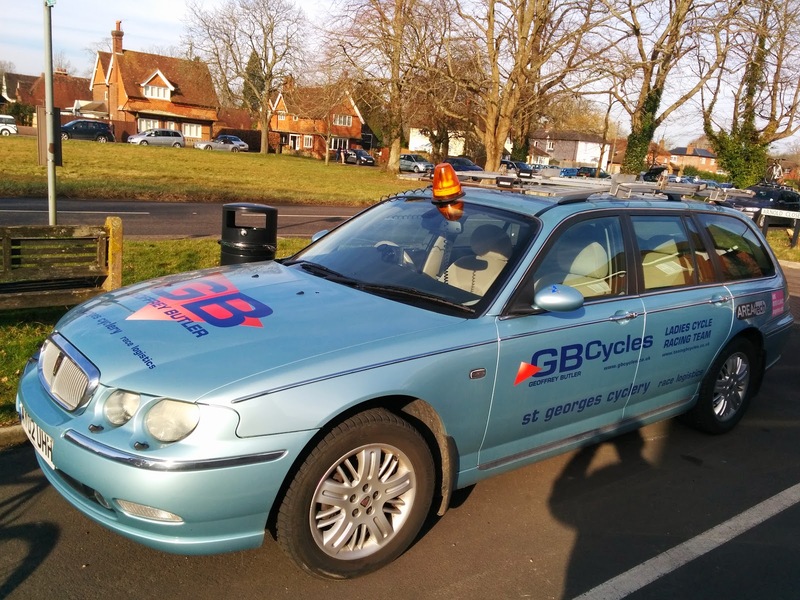 When they got more than a minute on the bunch the commissaries asked our car to let them pass us and wait for the peloton. When we got a visual on the peloton the Kingon Wheelers where at the front keeping the pace slow. Excellent work!!! So excellent the break made it to the line with Gareth taking first and Andrew taking second. I couldn't see the final, but I was super happy for them. Time to disappear. Go to the car. Eat a pasta salad and time for a siesta. I actually didn't sleep at all, but I managed to get 45 minutes of really relaxed time with my eyes closed. It really felt good. Sign in, get a coffee and sit for a while. Andrew commented I looked relaxed, and I really was. I had low expectations on the race, no need to stress myself. Time to go for a warmup, commissaries final instructions and off we go. Pace was not hard and I sat comfortable in the middle of the bunch for the most of the first lap. Now the tricky section came, a left turn, a couple nasty potholes, wet road. I break enough to feel comfortable and there I have to sprint for a minute to keep contact with the tail of the bunch. Short descend, left turn and we complete the first lap as "the climb" starts. Give it all for another minute and boom. I'm dropped and out of the race. My expectations were low, but not that low, couldn't help but feel disappointed. Killed the idea of quitting only because I needed the workout to meet my objective of the week so kept pedalling. Saw in the distance another rider and took me a bit of time trialling to get to him. When I passed him I said something that meant to encourage him to jump on my wheel, but I doubt I managed to say anything coherent in English. Luckily no words are needed to get to an agreement and we started to work together. Our pace was nothing mental, we kept it constant and I kept cadence around 100rpm when I was in the front in an intent of making sure my legs were going to last. Having someone to work with helped a lot. Not only because that allowed me to rest but also because it kept me motivated to keep it going (that and the support I got from my fellow Wheelers in every corner). Nothing happened until we were at 4 laps to go; and what happened was that we were about to be lapped. Fantastic, not only dropped in the first lap but also lapped by the field in a circuit that is 10kms long. A rider passed us and asked if we were in a break or dropped!!!!!!! We jumped to the tail of the peloton as they passed us. My objective now was to try to keep up with them to the finish. It was "only" four more laps. How naive. The moment we got to the tricky turn I lost contact with the peloton and there I was dropped for the second time and alone again. And here comes the moment of the race I'm more proud of. When I hit the top of "the climb" I saw in the distance the rider that was riding with me. He was not alone. There was another rider a bit behind him. I set myself to catch them. I thought I had to do it quickly, if they get together and start working I won't be able to catch them. It didn't look like they were working very well together, but still I was having a hard time to reduce the gap, but with 65kms in the legs and almost two hours racing I managed to put a consistent effort for more than 15 minutes. The third rider pulled out as I was passing him and a few minutes later I caught my companion. It took me a whole lap so when I got his wheel I told him I needed a minute to rest (and to get a gel). When I got my breath back we went back to work together. The pace had obviously went down, but hey, we were still there and only two laps to go. At some point a third rider (another third rider) passed us. We jumped on his wheel and we started to take turns. At that point I was really tired and I was struggling to make anything out of my turns on the front. Finally we made it to the final turn and here it came the final climb. The third rider decided he was going to softpedal his way to the line and I climbed it riding in parallel with my companion. When we got to the flat I tried to sprint but he was more clever and didn't even try (what was the point anyway?) so I eased and we both softpedalled our way to the HQ. Time to relax, eat something and comment the race with the Wheelers that were around. Despite of being dropped (twice) I felt happy and in peace with myself. Got to the car, my phone didn't have coverage so drove back following my navigation instinct. Miraculously (and because the phone did got coverage at some point) I got home. Got a shower and set myself to cook dinner for the family. I knew if I sat down I wouldn't be able to stand up again. Finished dinner and rushed to the computer to download the track and look at the numbers. Enough of peace with myself, the numbers revealed I was terrible today, I was dropped by a power*duration effort that I can do more than ten times in a trainer session!!!! I think I now have a very good idea of what went wrong. I was too relaxed. Way too relaxed. I passed through the tricky bend on the car 8 times and the idea that was a potential point of concern for me didn't even cross my mind. What was I thinking!!!! I look at my warm up and it is a joke. 3.5km, 8:26 minutes. Worst warmup ever (published here for public scorn). Even more terrible if you have in mind that I think I am very slow warming up. Now Javier. True, it is early for you to be competitive in these races. True, you messed up and you signed up for the wrong race. But a race is a race, if you are going to be part of it at least be focussed and do it properly. Finishing the race once you were dropped is ok but it is not good enough consolation.